TECHNOLOGY-PORTFOLIO.NET - Huawei is one of the Android smartphone manufacturers that targets many market segments, and this time the company will add to the list of new smartphones with the device model number JKM-AL00. The new smartphone is expected to launch under the name Huawei Y9 (2019) and the specifications of the new smartphone have now come out. It seems Huawei wants to target the middle-class market segment by launching more Kirin 710 chipset-powered smartphones. 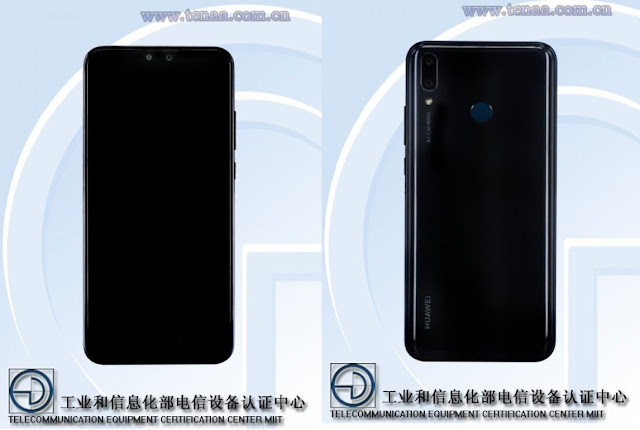 According to the TENAA list, Huawei Y9 (2019) will launch with a 2.2GHz octa-core processor and is available in two memory configurations, namely 4GB + 64GB ROM and 6GB + 128GB ROM RAM. The operating system that is run is Android 8.1 Oreo which is wrapped with an EMUI 8.1 display interface on it. This smartphone will carry a 6.5-inch wide screen with Full HD + resolution and has bangs at the top of the screen. For the main camera, Huawei Y9 (2019) has a dual-camera 20MP + 2MP setup to produce a blur in the background, while for selfies using a 16MP resolution camera. The dimensions of this smartphone are 162.4 x 77.1 mm x 8 mm and weighs 173 grams, so that is not an 8X Honor because the dimensions are clearly different. Inside the smartphone there is also a 3,900 mAh battery that is quite large. Unfortunately, it is not known when this smartphone will be launched and what price range will be priced.